This month’s All Hands meeting started with the Pledge of Allegiance, led by Lt Col Tinnirello,. The Pledge of Allegiance was followed by a moment of silence, in honor of last weekend’s Oakland warehouse fire victims. A big thank you to all of the first responders who assisted in the aftermath of this tragic event. Also a sad farewell to two of our members, Maj Kathy Johnson and Maj Chris Johnson, who are moving to Group 6. You’ll be missed here! Congratulations to Maj Steven DeFord and 1st Lt Eric Choate for their Form 5 checkouts in the 206. Congratulations to Lt Roberts for completing his Level II. We thank Maj Chris Johnson for his service as Group 2 Assistant CD Coordinator and congratulate Lt Choate on his appointment to that role. 6 Nov: EPIRB at Moss Landing - thanks to Maj DeFord (Mission Pilot, MP) and Capt Kathy Brown (Mission Observer, MO) – and congratulations on your find! 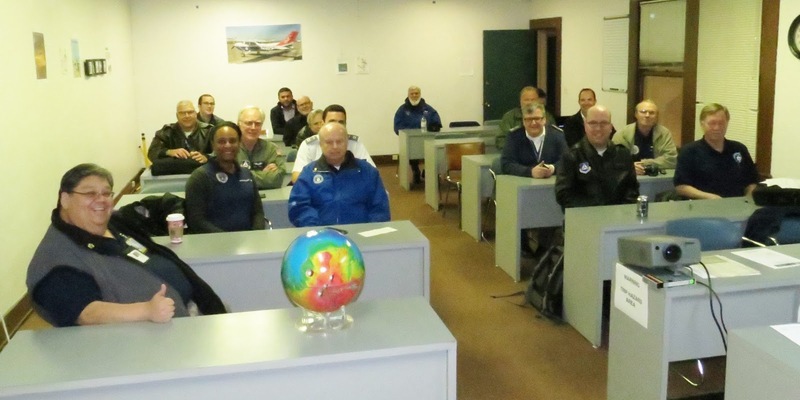 28 Nov: ELT @ Corning (0O4) – thanks to Maj DeFord (Incident Commander 3/Trainee, IC3-T), Capt John Stevulak (MO) – and congratulations on your find! 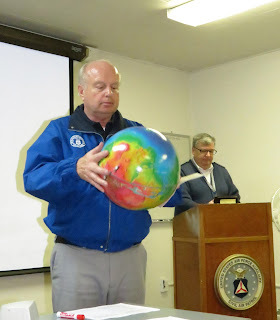 Lt Bitz holding showing a globe of Mars. 4-6 Nov: CAWG Education Conference, Bakersfield: thanks to the following members for giving talks: Maj Jeff Ironfield[DOV], Capt Don Eichelberger (Airborne Photography, AP), Capt Jordan Hayes (Communications), Capt Georgios Michelogiannakis and Lt Choate (SAR), 1st Lt Bitz (Aerospace Education). Additional attendees included: Lt Col Tinnirello, Maj Noel Luneau, Maj Maggie Wang, Maj DeFord; Capt Brown, Capt Lou Rivas, Capt Doug Perreira. Click here for details. 12 Nov: Group 2 Advanced Communications Course @ HWD: thanks to Capt Hayes, Instructor. Additional participants included Lt Col Tinnirello, Maj Wang, Capt Eichelberger, 1st Lt Al Chavez, 1st Hollerbach, 2d Lt Scott Booth, 2d Lt Tim Roberts, and 2d Lt Alexei Roudnev. Click here for details. 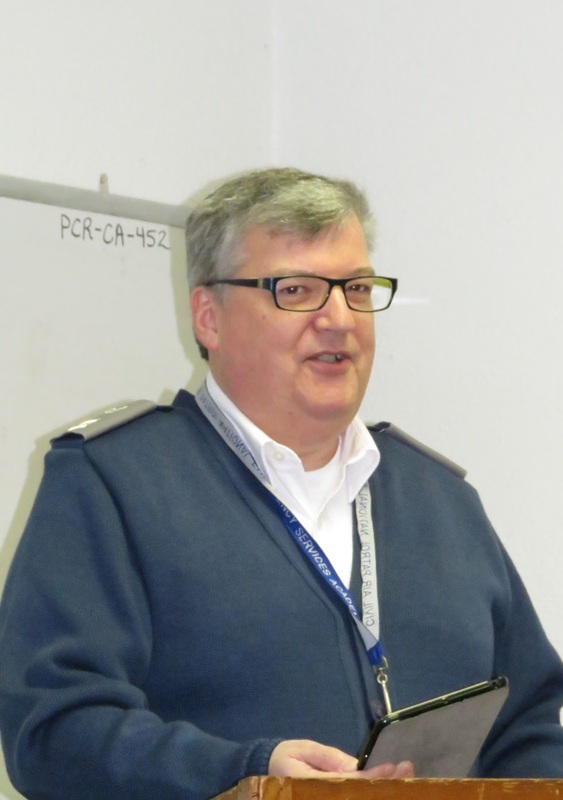 1 Dec: This marks the 75th Anniversary of Civil Air Patrol! Lt Roberts during his safety update on noise. Lt Bitz gave a reprise of his Wing Conference talk on Mars. During his talk, Lt Bitz passed around a glove of Mars and explained details of the landscape, which contains a volcano 16 miles (25 km) high! This volcano towers above the surrounding plains and stretches 374 miles (624 km) across - roughly the size of the state of Arizona. Click here for details on this impressive feature of the Mars landscape. 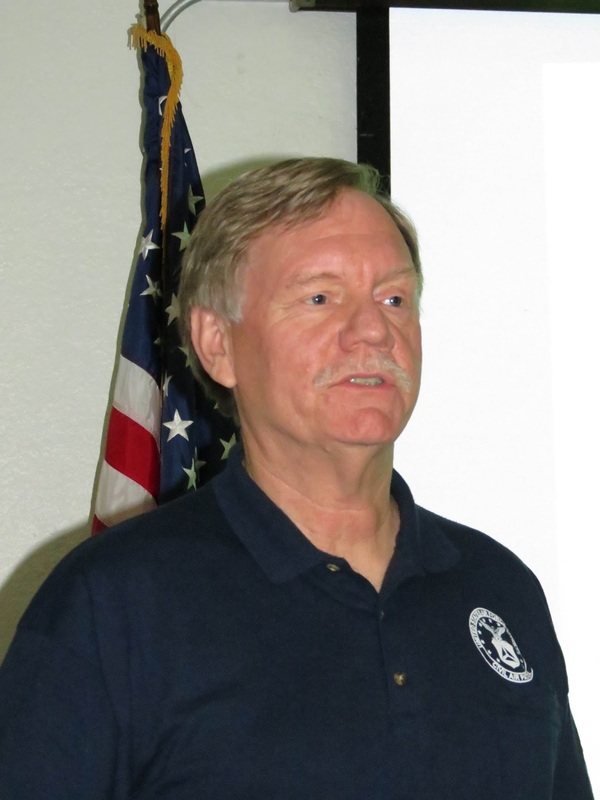 Last but not least, thank you for Lt Roberts and Capt Doug Ramsey, for providing this month’s Safety Update on noise safety, including airport noise issues and noise abatement.